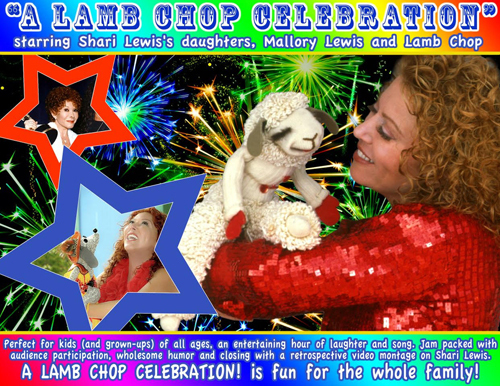 A Lamb Chop Celebration – Daughter of beloved children’s entertainer Shari Lewis and multiple Emmy award winning producer of Lamb Chops Play-Along, MALLORY LEWIS has been deeply involved in children’s entertainment her entire life. Lewis has appeared with Lamb Chop on television and at thousands of venues around the world. Now, along with Charley Horse and Hush Puppy, Mallory Lewis & Lamb Chop bring all of childhood’s favorite legends to the stage in an exciting, masterfully produced interactive show full of audience participation, laughter, music and dance. Drawing fans from 2 to 80, you and your audiences will sing and laugh along as these beloved characters come to life in a fun filled fantasy event.